Keeping tabs on sales, inventory, and orders is serious business. And the tasks that a good point-of-sale system gets called on to perform—everything from processing orders to maintain e-commerce sites—can be terribly complex. But that doesn’t mean using the software should be equally as complex—or that the interface for such an application can’t contain a bit of style. Take LightSpeed 2. The next version of the point-of-sale software won’t ship until February. But LightSpeed maker Xsilva Systems is showing off the upcoming release at Macworld Expo (booth #S2638). Any similarity between this and the look and feel of iTunes is purely intentional. In this particular view, order requests sit in the main window of the application organized by date. 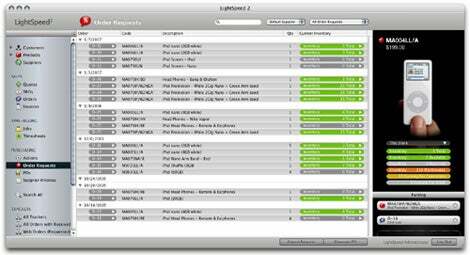 In the left-hand pane where you’d find iTunes’ Source List, LightSpeed instead features a series of tasks broken out by category—Quotes, SROs, Orders, and Invoices grouped under Sales, for example. Drag-and-drop one of those order requests over onto the Quotes icon, and a quote instantly is generated. It’s real slick. Of course, there’s more to LightSpeed 2 than just a pretty face. But the interface is enough to make Mac users interested in point-of-sale apps take a second glance.